At Flintobox, we constantly look for talents who can make a positive difference to the way a child grows up. Check our open positions to see if you can become a part of our fast growing startup, which thrives on learning opportunities. For all open positions, please write to career@flinto.in with your resume and a good time to call. All positions are full-time and the location will be Chennai. The Content Marketing Manager will be responsible for setting and ensuring the execution of all content marketing initiatives both internal and external to the organization. This role requires expertise in content publishing, data and analytics, brand development, communications, and leadership. This executive officer will coordinate with the sales, public relations, IT, and customer service departments regularly to maintain a consistent brand story and assist in customer satisfaction, lead generation and sales. The Content Marketing Manager will be responsible for the coordination of all digital and print content produced by the content team. The right candidate will have experience in cross-channel content marketing and content optimization including text, audio, video, image content, social media marketing, and search marketing. The Content Marketing Manager is a creative marketing mind with the ability to organize projects, meet deadlines, and manage a team. The ability to interpret analytics and troubleshoot web related technical issues is a plus. Defining, creating, and upholding the organization’s Style Guide. Overseeing the scheduling, publication, and overall consistency of Flintobox’s content assets. Coordinating day-to-day editorial operations, managing in-house and outsourced content creators, editors, graphic designers, videographers, developers, etc. Reviewing all assignments before publication to ensure material is accurate and on-brand. Leading and directing the work of content produced by content team members including text, images, audio, and video, making sure all team members are on task and meeting deadlines. Ensuring readability of content by identifying and correcting mistakes in grammar, punctuation, and spelling. Maintaining consistency of the brand by upholding the organization’s style guide standards on tense, voice, tone, and the spelling/capitalization of certain words as they relate to the organization. Successful experience leading a team in a project driven environment. A demonstrated ability to drive traffic to web properties from search engines. Proven experience using social media channels to distribute and amplify the organization’s content, manage reputation, develop relationships, and drive website traffic. Proven editorial skills including strong language skills and the ability to adjust content to remain consistent with brand, style, and tone. An understanding of how to create and present content that persuades. Demonstrated experience with using digital and/or print content to generate leads and sales. An excellent command of analytics platforms, such as Google Analytics or Omniture, to adjust marketing strategy and tactics. Exposure to content marketing tools such as Hubspot, Marketo, Unbounce, ActiveCampaign etc. will be a plus. Demonstrated ability to multi-task and meet a variety of deadlines. Ability to identify trends and adjust strategy using analytical and quantitative problem-solving. Superior ability to create compelling narratives for internal and external audiences. This position will be responsible for day-to-day acquisition campaign and budget optimization for channels including search, display, paid social and any affiliate platform. You will play a key role within the marketing team to drive quality traffic and conversions to meet our business goals. Manage traffic campaigns from concept to completion; work closely with marketing team and content producers to realize ads and landing pages. Develop and manage performance of campaigns on CPM, CPC and CPA models Plan and purchase digital media (display, social, native, mobile, video) while effectively meeting CPA / ROI goals for direct response campaigns. Negotiate commercial terms with media partners or providers. Manage a team of ad traffickers. Hands on experience in using Facebook Ad Manager, Power Editor, Google Adwords is a must. Good understanding of various online products like Search, Social Media, Display is required. Analytical, strong ability to draw insights from traffic and campaign trends and develop effective tactics. Understanding and the ability to create targeted landing pages for ad campaigns. Google Adwords Search / Display / Analytics Certification will be a plus. We are looking for a creative Copywriter to write clear and concise copy for ads, emails and websites. Your words will inform and engage target audiences. Our ideal candidate is a team-spirited, skilled and imaginative writer with an eye for detail. If you can grasp project requirements quickly and offer valuable insight, we’d like to meet you. Submit up to three writing samples, so we can get an idea of your best work. Feel free to include links to your content or portfolio in your application. We’re looking for a Graphic Designer with a high creative quotient to design and communicate visually appealing content that represents our company. You will work on different kinds of engaging content including websites, banners, videos, corporate identity etc. and work closely with our design and sales team. You should have a keen interest in designing, branding, marketing and should be proactive in building attractive visuals. Conceptualise and execute marketing projects from ideation to production, including ad campaigns, websites, videos, brochures and other marketing collateral. Ensure that all visuals strictly follow the brand design guidelines. Work experience as a Senior Graphic Designer or similar role. Ardent learner and immense knowledge in graphic design, styles and layout techniques. Strong knowledge of Adobe Creative Suite. Experience with HTML, motion graphics & GIFs is a plus! We are looking for an experienced Digital Marketing Specialist to assist in the planning, execution and optimization of our online marketing efforts. The ideal candidate will have a passion for all things marketing and technology. You will be tech-savvy and intuitive with great ideas to reinforce our marketing campaign. Do you think you are smart and understand what it is to be a HR, become one. Here is an excellent opportunity to get your hands dirty. Come be a part of flinto and become a change maker. Recruitment: Should do the job listings in job portal and spread awareness in social media. Talent Acquisition: Should identify talents matching our requirement and do the initial screening. Take care of the onboarding and offboarding process and documentation. Manage the attendance tracking system and provide the payroll team with all the necessary data to process payroll. Resolving HR related queries to Employees on Leave, Attendance, Certificates. 1 to 2 years of experience as HR with any Bachelor and Master Degree (preferably HR). Should be able to converse fluently in English. The Customer Support Executive (CSE) will proactively engage with customers to provide product guidance and post-sale support to increase the value their kids acquire from Flintobox’s theme based activity kits. Work with Program Manager (Customer Success) to derive data driven insights/intelligence to run focused and result-oriented customer engagement programs. 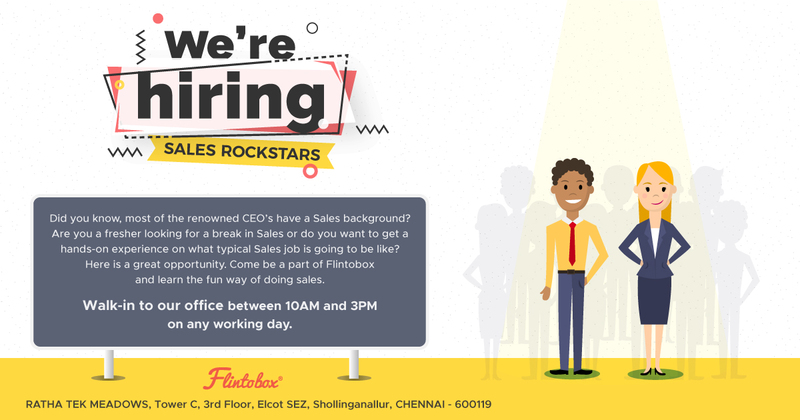 Flintobox is seeking a communication training specialist for its Seller Support team. The responsibilities will include design and content development for training and training delivery. Grooming associates via training or individual effective sessions. Training support will span over new hire Associates and seasoned Associates and team leads in the organization. The Language Trainer shall, in consultation with the leadership team, design and implement communication skills modules for the new hires & production teams. She/he will look into the timely recognition of communication issues at the site and actively work on changing the behavior or adding skill. Create a timely TNI for all the skills and design and deliver appropriate content for these trainings. Support hiring of Associates and extend support to certify associates on a periodic basis. Identify a regular monitoring process to check the effectiveness of the implementation (in context with customer service attitude, grammar, language correction, pronunciations, response modification, personalization etc.). Conduct audits to regularly score Associates on the language content and develop a suitable language proficiency scale and testing mechanism. Work with Associates and team leads in identifying development opportunities in communication / soft skill and presentation skills, giving attention to the agents who need more focus. Train the team leaders and SMEs as required. Coordinate Training including communicating with appropriate business owners: seller support team leaders; Subject Matter Experts and Associates to ensure all trainings are conducted on-time and with sufficient resources and facilities. Site Training Administration , including administering testing and certification, managing the training calendar, reporting on work outcomes and impact, scheduling, and partnering with the leadership team to deliver all curriculum development, training and other learning intervention requests. This role will also include use of surveys, quizzes, performance metrics and other available tools to evaluate the effectiveness of training and assess new Associate learning and skill development. Overall, S/he will be responsible for driving high quality training provided to Flinto employees and play a significant role in the development of a successful, effective global Seller Support team. The ideal candidate must be a graduate with English as Primary Language with excellent communication skills. T3 Certified on any soft skill process. CPLP or other learning/training certification. Has worked on and developed language training and communication training modules. Excellent classroom management and blended learning facilitation skills. Skilled in planning, implementing and assessing training. Demonstrated knowledge of adult learning and training practices especially in Language and process contexts. Has exposure to and has done coaching in the area of soft skills. Responsible for leading and supervising websites / technical systems with technical team as they develop, enhance, test develop, test, modify, and create solutions. Responsible for Design , Develop, Test and Bug fixing of technical requirements. Experience in developing high traffic customer-facing web applications, that interact with a database. HTML, CSS, JSP, Java Script Bootstrap, XML, JSON. Responsible for generating reports for management / all other teams. Strong knowledge of SQL AND PLSQL on MYSQL (Preferred) / Oracle Platform. Monitor and recommend changes if required to all PLSQL, Existing Queries. Assist team in designing data model. Knowledge on performance enhancement of queries / Tables / PLSQL. Prepare /Build Denormalised database for reporting. Database Administration is a added knowledge. Responsible for designing and developing android applications. Design and development of Android applications from scratch. Understanding, Enhancing and bug fixing of existing applications. Analyze, Integrate and test API wherever required. Experience in SQLiteDatabase will be added advantage. Responsible for designing and developing iOS applications. We’re on the lookout for a designer with a high creative quotient and a keen interest to enthrall children with fun and educational activities. In this role, you will be the superhero in the product development process -- assisting at all stages of development, from conception through manufacturing and shipment. You need to be a curious inventor who loves to explore and constantly learn about new materials and techniques. Ideation, brainstorming, and keen research We’re developing new themes and concepts for different age groups, and for this you need to be a creative venturer who loves learning! Prototyping and design iteration. You must be a maker at heart. Physical prototyping drives our process forward. We convert our workstations into creative laboratories by experimenting with different materials and bringing sketches into life. Material sourcing and sampling. We work closely with our Procurement team to ensure all our products meet the highest safety and quality standards. Content. Content makes or breaks the product! What good is a project if no one knows how to use it! We work closely with our content team to provide clear instructions and videos. Our start-up superhero league requires go-getters with a strong team-spirit. Fiercely creative and keen interest in early child development. Simply put, you need to be a kid at heart! So cast your magic spells, play around with creativity and conjure phenomenal activities that spark curiosity in kids! Experience: 1-3 years+ designing physical products. You need to have been there, done that! Strong experience in all stages of the product development process, from conception through to a finished product. Immense physical prototyping skills. You’re a creator! You enjoy experimenting and conjuring physical products out of thin air! Adaptive, ready to face challenges, and a go-getter attitude. You are eager and able to tackle any issue that may pop up. You can face all kinds of scenarios with level-headedness. Time management skills and ability to multitask. Effective prioritization and organization to seamlessly move forward. High attention to detail. It’s all in the details! We look to excel at even the minute aspects in every stage of production! Collaboration & communication skills. It’s a strong nexus. We work closely with our Operations, Procurement, Editorial, and Marketing teams. You need to be a team-player with strong communication skills. Ardent learner. You need to love exploring and try your hand at all sorts of creative tasks! Know what’s up and new in the market and what would best suit our product. More about you: You need to be creative, positive, enthusiastic, motivated, dynamic and thoughtful! We're on the lookout for a product design intern who wishes to make a difference in the area of Design for Children. You will work with our product design, procurement and content teams to develop fun educational activities that our little customers will delight in using to create, build and explore. This internship period would start immediately. Work closely and effectively with the Product Design, Procurement and Sourcing teams to create fresh hands-on activities (arts, crafts, science, imaginative play, and more) and identify the appropriate set of materials for our activities. Develop new concepts and prototypes. Present customers with new ideas and prototypes for feedback and iterate as needed. As a start-up, we seek creative thinkers. We want team players with contagious spirit and a go-getter attitude. You must have a strong desire to constantly learn and explore. A strong work ethic, communication skills, high levels of empathy are important for this position. Passionate about kids and creativity. Be a child at heart and have a keen interest in hands-on learning and development. Go-getter attitude. You are eager and able to tackle any issue that may pop up. You can face all kinds of scenarios with level-headedness. Attention to detail. It’s all in the details! We look to excel at even the minute aspects in every stage of production! Ownership and Resourcefulness. You see a project from its nascent stage right through its successful completion. Looking for a visual thinker who is sensitive to communicating to children through playful and simple visual narratives for Flinto. Education: Graduation in Graphic Design or Animation or Fine Arts or Visual Communication. NOTE: Someone with prior experience in illustrating storybooks and comic strips for children; creating assets in book publication/ gaming industry is a plus. Visual Interaction Designers take a pivotal role in the creation of remarkable experiences that delight, enlighten and support children, parents and educators from around the world. A well-qualified individual will have experience in mobile gaming, app, website, and activity design. Develop styles and interactive experiences based on new and existing IP. Drafting conceptual ideas, wireframes, and mock-ups. Developing concepts, graphics and layouts. Problem-solve usability and design issues. Identifying achievable solutions that deliver brand consistency and improve overall experience. Final game, app, web and activity design. Proficient in Adobe Creative Suite; Photoshop and Illustrator is a must. Game interface and user experience. Experience in UI design implementation and a working knowledge best practices. Strong understanding of visual design principles in terms of typography, grid system, composition, color theory. Passion for mobile gaming, with a clear understanding of the various game types. Responsive web-design experience is a plus Qualifications. Previous design experience, especially in gaming and/or mobile. Design portfolio (required) Bachelors degree in Graphic Design or a related field (preferred). Flinto is seeking a full time in-house Game Designer. This role will be responsible for establishing the vision for games through close collaboration with our early learning team. This leadership role will help to ensure that each game is fun to learn and fun to play, while achieving curriculum objectives. Tasks include developing initial concepts, working with educational advisors to ensure seamless curricular integration, providing clear documentation to the production team, working through questions that arise in production, and evaluating deliverables. The position requires a high attention to detail and the ability to react to the needs of creating a fun game experience that works across a variety of browsers and mobile devices. Design, define, and comprehensively document: game mechanics, character use, storylines, assets lists, text and dialogue. Work on the pipeline of games from concept to final release. Prepare and present game design concepts to stakeholders and implement feedback. Design curricular elements of games in collaboration with educational advisors. Create testing goals and user testing scripts for play test sessions. Research and suggest effective design practices and work flow processes. Proactively identify issues and problems and offer solutions. Prioritize and self-manage tasks to meet deadlines. Mentor other members of the team, where appropriate. Meet personal and team targets. Perform other related duties and special projects as assigned. 2- 3 years experience as a Game Designer with credits on published game titles. Experience in developing games for desktop and mobile devices. Degree from a four-year college or university, or equivalent experience. A deep knowledge and understanding of current trends and their use in all areas of gaming (i.e., mobile, browser, social, etc.). Knowledge of game industry practices, and the ability to understand technical parameters. Ability to communicate equally well with technical and non-technical team members, both verbally and in writing. Ability to work within a fast-paced environment and aggressive deadlines. Strong collaborative skills with the ability to work well with cross-functional teams. Excellent organizational and presentation skills. Proficiency using Microsoft Office, Microsoft Project, JIRA and Confluence. Ability to create visual aids and mock-ups using Adobe Photoshop, Illustrator, or Flash. Knowledge of educational game industry practices. Experience developing children’s games is strongly preferred. Knowledge of Unity and HTML5. We are looking for someone who can drive new preschool acquisition in a given territory. Our expectation from the applicant would be one who can conclude a "sale" independently. . This will ask for building database, visit schools, gives presentation to owner & key decision makers, follow- through for getting academic buy-in and submission of proposal & closing the deal. It will require extensive travel within 100KM radius from your base location. Sell FlintoClass solution within a territory. Provide weekly and monthly sales action plan to manager, reflecting the activities required in each account to achieve sales objectives. Able to negotiate and close sales in routine situations, and with guidance when handling more complex deals. Participate in Trade Displays and Conference when required . Experience selling in education industry is a strong plus. Experience in Direct Solution Selling (not distributor/channel). Extrovert, Assertive and Persistent (not - yes sir/I will get back to you ). Strong presentation skills in English and local language (should be comfortable in addressing a group). India’s leading educational startup in consumer space is hiring for Sales Head/VP Sales to scale its sales operations pan-India. Head the telesales and field sales team, motivate and provide feedback to the team members on performance, identify areas and coach them for enhancement/improvement, collate market information, and suggest necessary course corrections. Ensuring enhancement of sales effectiveness through process training & quality audits. Overall responsibility of Revenues/Sales Strategy at National Level. Work with leadership to develop sales plans in line with market realities and organizational goals and communicate the overall sales plan to the team. Establishes sales objectives by forecasting and developing annual sales quotas for regions and territories; projecting expected sales volume. Scan the environment to gain insights into competitor strategies, potential business opportunities and market trends. Focus on process innovation and come up with ideas on improving dialer operations, also identify and build new sales sub-verticals apart from the existing ones and take them to the next level of revenue generation. MBA / Engineering degree from Tier 1/2 institutes like IIMs, SIBM, MDI, IMT, NITs will be preferred. The role requires sales leadership with strong knowledge and experience of minimum 10 years in Inside Sales, Direct Sales & Dialer Setups. Excellent analytical ability and data orientation to synthesize complex business issues and to apply that knowledge at solving problems and executing action plans. Desire and ability to understand and relate product, technology, strategy and sales. Ability to be creative and adaptable in a dynamic entrepreneurial environment. An inspiring leadership style, which is collaborative; the ability to develop a continuous pipeline of leaders. Key objective - The incumbent will be responsible for building, leading, training, managing the development of a sales team. He will be responsible for penetrating Flinto in the designated region. Will ensure team has the guidance, resources, and skill to dramatically increase sales by identifying market opportunities, driving new business, and expanding on a base of existing customers. Will work closely with the CXO team to develop short and long term strategies to efficiently grow the total business. Will be expected to be hands on, a lead-by-example person spending 2/3rd of his time in the field working directly with sales representatives and customers and will also maintain several of his/her own accounts with high-profile customers. Scale up in the future to a general management role to lead multiple regions/states. Knowledge of selling, negotiation, and commercial process in the context of a B2B sale. Experience of solution/product selling management. Build an organization including coaching and developing people. Able to see the importance and skilled at the how-to of doing so. Continuously motivating the team and tying the vision to daily deliverables. 5-7 years in a B2B institutional solution sales business, ideally dealing with SME/Tier 2,3 type market context. Experience in educational sales market is an added advantage. Can carry a team, able to work with other functions, resolve conflicts. Transparent in communication. Can assert point of view openly and fight for ideas. Resilient, good under pressure and manage stressful environment. Experience in Sales is always welcome. Even if you don’t have the experience, but are passionate about it, give it a shot. We welcome learners!